I bought another bottle at a craft store (one of the ones that is rounded and looks like a potion bottle) and filled it with the BBs too. I just leave it on the shelf with some other bottles filled with things and it makes a nice display. Oh! If yours are white, they would probably look good in a clear vase, with some fake flowers in it. And of course, you can always glue them to things or embed them into things. They would probably be useful in one of those "Tiny things" type of crafts that everyone around here seems to be doing lately. Such great stuff! I love the pony scene!! One of these days I'm going to take the time to make something like that. 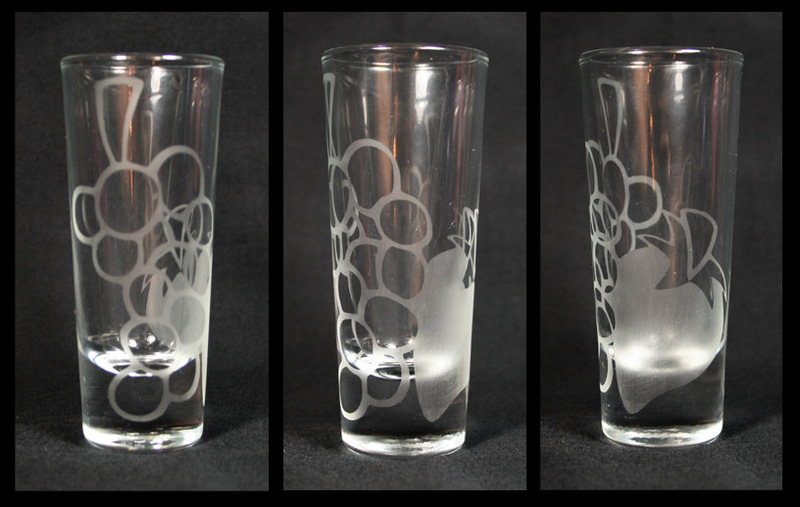 Also, I have pictures of the shot glass I sent, which shows the etching a little bit better. I was so impressed by how well it came out! I wasn't expecting it to be so great. Alrighty. After a night of traipsing around behind our youth group as they went trick or treating, I can now post the pictures of the great swap SKooKuM sent us. It's exactly one of the things I've been lusting after! Twilight's balloon lights up and everything! And the little Twilight in front there was... somewhere else in the package I don't remember. She looks like she might be from McDonalds. 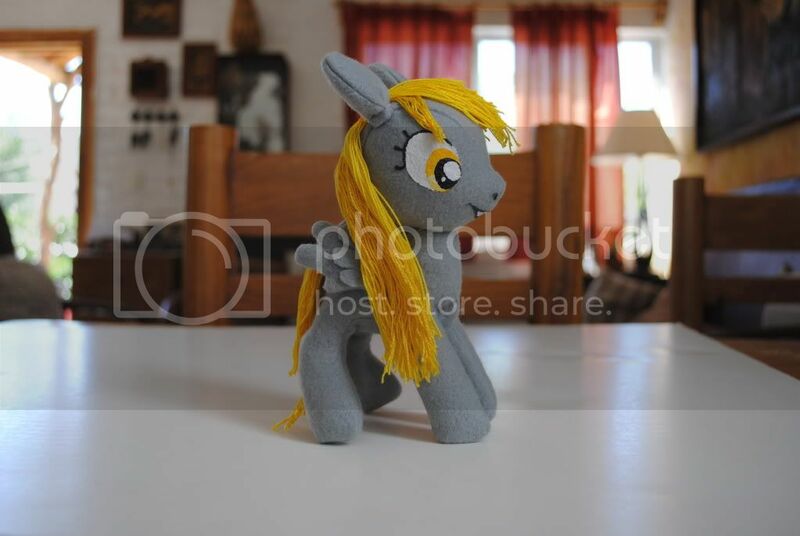 But I'm not complaining, because now I have ANOTHER Twilight toy. Two Twilights! Yes! 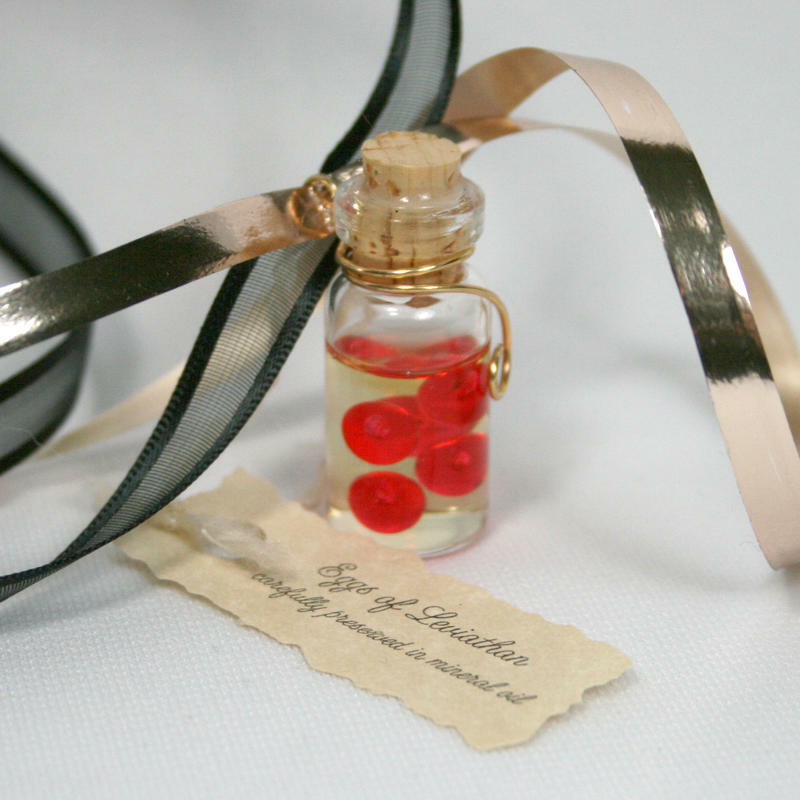 The first little box-within-the-box I opened contained these adorable little bottle pendants! One themed for Spike, Twilight, and Princess Celestia. Who told you I like bottles? If I did, I don't remember. Next, I picked out a box with Matt's name on it, so I handed it to him to open. Out popped Fluttershy! An adorable, amazing, posable Fluttershy! Matt exclaimed "Fluttershy!" and after a moment of looking it over promptly said: "Yay." in his best Fluttershy voice. Oh, wait! I forgot about these! I might have seen these first or second. I don't remember. It was in that beginning rush before I remembered to take pictures. And adorable journal and bag with Twilight on them! I love the quote, too! Where on earth did you find these? We don't have anything like that around where we live. Love! My very own little Twilight doll like Fluttershy! (Except mine is bigger! Yes!) Her eyes are all sparkily, and her hair is done up perfect! I love her so much! And she came with a little hair piece. The last little box revealed some cute shrinky-dink jewelry! Derpy, Twilight, Spike, and cupcakes/muffins! I hope the picture does them justice. And you'd think that was all, but no, the package got even more awesome. Yet another package with Matt's name on it, which he opened up to find a letter. And what was under that letter? But an AWESOME painting of the character Professor Fandango as a pony! One of my husband's best friend's characters! And so well done! He loves it! Thanks so much swap partner! I am SO excited to see more packages! 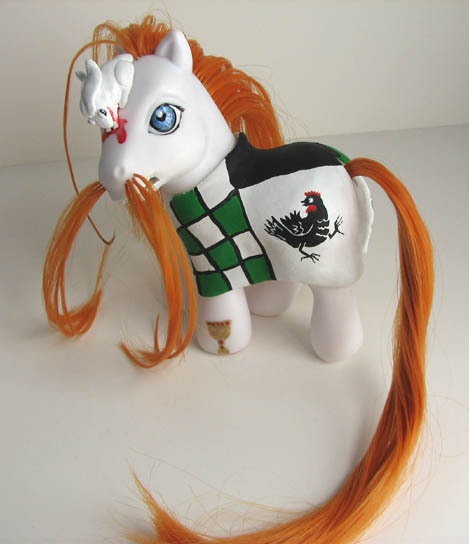 Holy Pony, I can't believe someone has already received. Guess I better kick it up a notch. lol. Oh yeah thought I would share this with everyone in the halloween spirit.Its not ours, we are doing zecora though. I'll post pics when its done. EDIT: hmm... the picture doesnt seem to be showing. Wow. That is one cool pumpkin. I'd say... oh, at least 20% cooler. I think she did a bang up job!!! That's so great! I was just about to share that same link! And I agree; she did a great job with that plushie! That one is actually for sale. The current bid is $640, though! Ouch! Depends on how far I get on my son's Halloween costume. He's going to be Sir Robin from Monty Python's Holy Grail. I received my final envelope today. The extras from crazyalien8! It looks as though I was stalked a bit in her making these, and they're just as beautifully detailed as the alphabet letters she sent me! Yesterday I received my extras from pogo, and today I received my final letters from crazyalien8! Woohoo! So here's some pictures! First, the extras that Pogo sent me. In beautiful green as requested! And she totally upped me by sending 12! Wow! Next, the letters sent from crazyalien8. The detail on these is incredible, and each of the animals is cut-out! Also, I never knew there was a type of fish called Zander. You learn something new every day. And now, the grand finale! The entire alphabet I received from all of my great swap partners!